The Elusive Guanaco: Is Evolution Like a Tornado Through a Junkyard? When I was in high school I remember being dragged by a friend to the lunch-period Christian club. It happened to be year book picture day, and so my reluctant visit is now forever etched into history. To my delight, the talk was on evolution – as I have shared before, this was a topic I found endlessly fascinating, primarily because the entire concept seemed so very absurd. The leader of this group told us a hilarious analogy, one which I would hear repeated by other Christians across Canada, and read on numerous Creationist websites. I assume this means that most of you have heard it too. The story goes like this: Imagine you have, within a junkyard, all of the parts necessary to make a Boeing 747 airplane. They are randomly scattered throughout the yard, with all sorts of other garbage there as well. One day a tornado rips through that junkyard. The winds stir up all of the pieces, moving them around and crushing them together; when the tornado has passed, lying in its path of destruction is a perfect, fully formed and functional Boeing 747. Although this sounds implausible, this is precisely the story evolution tells us. Therefore, evolution is as unlikely as a tornado forming an airplane at the dump: absurdly unlikely. I remember we all laughed at this story and shook our heads at the extremely foolish lengths scientists would go to discredit God. Apparently, this story was first told by the astronomer Fred Hoyle in 1982. Hoyle was trying to promote the theory of panspermia, which basically says that life is too complex to have evolved on Earth, and must have been seeded from space. It was then appropriated by Creationists for their own ends. Unfortunately, this story completely mischaracterizes evolution. If you are a Christian leader, I would ask that you immediately cease and desist from telling this story. Continue to be opposed to evolution, if you must; but please, at least get evolution right. 2. It presumes that the random process is destructive. We all know what tornadoes do. They destroy. They do not build. But the random process in evolution, namely, mutations, is not necessarily destructive. Although we tend to hear about mutations in relation to human health, primarily in that such-and-such a mutation produced such-and-such a disease, this is not the whole story. We know many, many instances of mutations having no effect, or of being completely beneficial, or, more complicatedly but more accurately, having a negative effect in one environment but a beneficial effect in another. One need only think of sickle-cell anaemia for this last example. In North America people with two copies of the mutant sickle-cell anaemia gene are likely to die without medical treatment. But in Africa carriers of sickle-cell anaemia (people with one copy) are more likely to survive than those without it, because malaria has a difficult time surviving in these mutant red blood cells. So this is a beneficial mutation in Africa; if malaria was a world-wide phenomenon, we would expect sickle-shaped red blood cells to be the norm. 3. It presumes that evolution is only random. The real absurdity in the story is that the tornado, by randomly throwing parts around, creates something functional. We all know that this could never happen (or at least the likelihood is infinitesimally small, although I personally have my doubts that infinite attempts could ever form a plane – and if it did, I would not be standing in line to get on board!). We know that human design and skill are necessary for putting all of the parts properly together. By analogy, then, we are told that the randomness of evolution could also never form life. 1. Random mutations are generated – these may produce good effects, bad effects, or no noticeable effect. 2. Natural selection – this weeds out the bad effects and promotes the good. It is selection that is lacking in the above story. Richard Dawkins, in The Blind Watchmaker, presents his own counter-story. He asks us to imagine a single monkey chipping away at a computer. This monkey has access to all the letters of the alphabet and the spacebar. The computer it is typing on only allows 28 characters to be typed per line. 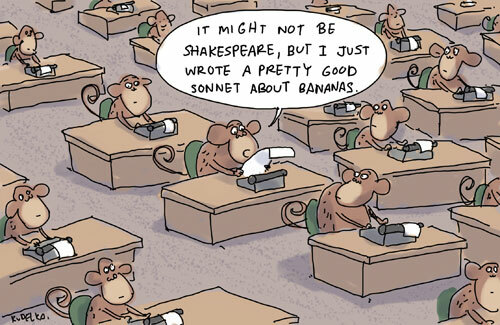 What is the likelihood that it will type the Shakespeare line ‘methinks it is like a weasel’? There are 27 characters it can type, and 28 spots for characters – the probability of the monkey getting it right on the first attempt is one in 2827, which is greater than 1 000 000 000 000 000 000 000 000 000 000 000 000 000. In other words, you are either going to need a lot of monkeys, or a lot of tries, to construct even such a simple sentence. And that is because the characters that the monkey chooses are completely random. the M, the first space, and the first i would all be preserved for the next attempt, and could not be written over. It would not take long for the sentence to be constructed. In a more biologically realistic scenario, imagine that there is no monkey; instead the computer begins by randomly generating 28 letters and spaces. We will call this first line the parental line. The computer then copies this line repeatedly, producing multiple ‘offspring’ for the next generation. However, it is not a perfect copier (indeed, in biological organisms, DNA is not always perfectly copied): there is a low ‘mutation rate’ which alters one or a few of these characters. The computer then reads through all of these offspring and selects the phrasing that most closely resembles the target sentence, no matter how slight that resemblance might be. So if the first letter is an m, but the rest of the sentence is a bunch of x’s, that is still closer to the target than a sentence of all x’s. This selected sentence is then copied repeatedly for the next generation, with the same mutation rate. It is possible that the mutation that was selected will be lost, and another mutation arise somewhere else that is ‘beneficial’. It is possible no mutations in that generation will be beneficial. But by slowly maintaining and accumulating beneficial mutations, the target will be reached. Within 43 generations selection combined with randomness produced what would have taken randomness alone millions of millions of tries. The Boeing 747 story misses out on the slight, gradual changes wrought by random mutations, the weeding out of bad mutations by selection and the enhancement of the good, and the inheritance of traits from one generation to the next. Even evolutionists would admit that the airplane story is absurd, and any evolutionary explanation that was analogous to it would be equally absurd. But Darwinian evolution by natural selection is not analogous to a tornado going through a junkyard; it is analogous to a computer typing out ‘methinks it is like a weasel’. One of the biggest objections to Dawkins’ counter-story that Creationists have jumped on is the ‘target’ sentence that is first programmed into the computer. This, they say, is evidence of design! Of course, this is taking Dawkins’ story too far – he only intended to show how selection combined with randomness can move something from infinitely unlikely to highly probable. Others have grumbled about the progressive nature of Dawkins’ evolution, as if there was some ‘final state’ the sentence needed to achieve before it could be ‘complete’, such progress being a meaningless idea in biology. But these grumblings are unfounded. If we can get away from sentences for a moment and talk biology, evolutionists often speak of ‘adaptive landscapes.’ This intimidating phrase is really a word picture. Imagine you had before you a series of peaks and valleys. Each peak represented a perfect match between an organism and its environment, such that it produced a maximum number of offspring given the dynamics of the environment. The valleys represent a perfect mismatch, meaning that organisms that have those valley traits are likely to perish in their environment. Imagine we begin with a population halfway up a hill. There is no intention on the organism’s part to climb that adaptive peak. It simply exists, and passes on its genetic material to its offspring. Sometimes mutations will arise that result in offspring slightly closer to the valley – they will not do as well as the rest of the population, and those mutations will eventually be weeded out by selection. But some mutations will bring individuals higher up the peak, and those mutations will spread through the population, since all those without the mutation will be slightly closer to the valley than these mutants. In such a way the population unintentionally moves towards its target – that target being the top of the adaptive peak. Of course, in reality the adaptive landscape is constantly shifting with changing environments, population sizes and interactions with other organisms. So organisms may find themselves on the peak, just to find the ground give way underneath them, launching them halfway up a new peak, or into a valley. Selection combined with mutations will kick into gear again. In such a manner does life evolve, with different species inhabiting different adaptive peaks. At least, this is one way to visualize evolution. And it is certainly more accurate than a tornado through a junkyard. I find it rather curious that this analogy is widespread...I have not run into nearly as many strange anti-evolutionary curiosities as you despite my similar love for dinosaurs etc. in my childhood.